Do you want to spend time in a sweet cottage on a lake surrounded by National Forest? Ursa Minor, named for the constellation ‘Little Bear’, is nestled within the Sleeping Bear Dunes National Lakeshore, a 35 mile stretch along Lake Michigan in western Michigan, considered by many one of the most beautiful shorelines in the world. The vintage, 800sq. 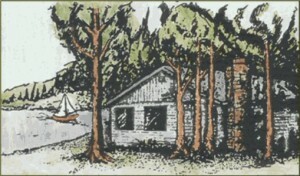 foot, knotty pine cottage overlooks a spring-fed Lake, good for swimming, boating and fishing.